Care of Pregnant Dog.... What your pregnant dog wants you to know! Glad you asked! Stick around and we'll have you up to speed on the care of pregnant dogs in no time. That's assuming of course that you already have a pregnant pooch! On the other hand, perhaps you're here to learn more about dog pregnancy before deciding whether to breed your dog. Great! Even though you love the idea of witnessing the miracle of nature and hearing the pitter-patter of tiny pooch paws, you also intelligently realize that now is the time to consider your best friend first. Right off the bat, the first priority when choosing to breed a dog is a plan for the puppies. Having "guaranteed" loving homes lined up before mating is essential, as is being prepared to raise them yourself if someone backs out. There's no compromising on that point in our view. With so many thousands of dogs left abandoned, dog breeding is not to be taken lightly. Alternatively, adoption of a shelter dog - even a pregnant dog rescue is a heartfelt choice to consider before you make your breeding decision. Is Your Dog "Pregnancy" Fit? Good health is vitally important if you're planning to breed your dog as this will have a strong influence on the success of a pregnancy. Fitness and good health will not only make it easier to care for a pregnant dog, it will also lessen the risk of complications along the way. To be on the safe side, have your vet do a complete physical to evaluate your dog's health to make sure she is fit enough for a successful breeding. Also to find out if your dog has any inheritable conditions that you would not want to show up in the puppies. Another factor you'll want to check out is whether your dog is likely to need a cesarean. Some breeding trends have resulted in dogs with pelvises too small for normal birthing. And if your dog does not have a normal anatomy, you may not want to breed her at all. First and foremost, after your dog has been mated, make an appointment with your vet for a dog pregnancy test. Your vet will likely do a general health check along with a blood test to look for changes in the hormones related to pregnancy. He may also perform a dog pregnancy ultrasound if he determines your pet is about three weeks along. Once the pregnancy is confirmed, the vet may want to schedule follow up visits to make sure all is going well. While the pre-natal checks may only be needed two or three times, they are highly recommended - especially if you are new to breeding. These visits are a good time to get your questions answered and to clarify anything you're not sure about. This will give you added confidence in caring for your pet during the pregnancy. Along about the fourth week, the puppies can usually be felt by a manual exam, but this should only be done by your pet pro to avoid any risk of harming the growing fetuses. X-rays are sometimes taken at 45 days to confirm how many puppies are present and to check the bone calcification. Before dogs were domesticated, they were pretty good at fending for themselves. Even so, it still probably came down to survival of the fittest with respect to birthing a healthy litter. Now they are family pets and dependent on you for all their daily survival needs, and even more so when they are carrying precious cargo! When you take this journey with your pet, the more you know about how to care for your pregnant dog, the easier it will be. So stay tuned and we'll help you with the basics. How long is a dog pregnant? The simple answer is 63 days. But to be more specific, puppies can be expected 63 days from the date of ovulation. For professional breeders that want to pinpoint the exact fertile period, ovulation detectors are available. How to tell if a dog is pregnant? Aside from going to the vet to have him run a dog pregnancy test, some breeders prefer to use an at home test kit. Most of these kits contain at least five tests, so if the first test is inconclusive, then another can be run a few days later. While the majority of dog pregnancies progress without a hitch, you'll still need to take good care of your pregnant dog and keep a watchful eye on her just to be on the safe side. Things can go wrong during dog pregnancy and whelping which may require trips to the vet, so you'll want to be ready for anything. Arming yourself with lots of sound information about how to care for a pregnant dam will give you more confidence. Our week by week dog pregnancy calendar will help you to know what to expect. You probably already know that the condition of a dog's health is greatly influenced by the nutritional quality of the food she's been given over her lifetime. 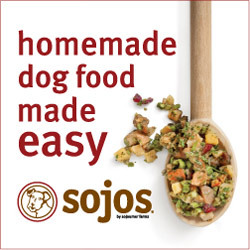 Premium quality food without additives and chemicals is the best recommendation we can make. If your dog has been raised since puppyhood on a diet of high quality food then your pet is no doubt ahead of the game "healthwise" which will likely make her pregnancy a breeze. During gestation and nursing, nutritional needs of the pregnant dog and the developing fetuses, is a top priority. This is the time to make sure the diet is optimal, so don't cut corners on her food quality now. 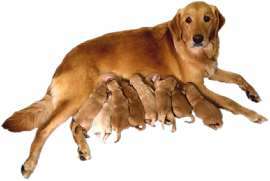 One thing you'll want to make sure of is that there is no deficiency of vitamins and minerals in the diet because if there is, the mother's body will get depleted by the primary needs of the growing pups. However, when it comes to Calcium, any supplementation of this mineral has to determined and fine-tuned by your vet. Calcium needs of a pregnant dog increase significantly in the late stages of pregnancy and/or during the start of nursing. Some dogs may experience low levels of blood calcium at this stage possibly causing them to suffer from a serious condition known as eclampsia. As the pregnancy progresses, food servings will gradually need to be increased, especially with respect to protein, to make sure your dog has sufficient reserves when the puppies arrive. Expect to make adjustments of 2-3 times more by the 3rd or 4th week. Be sure you're well informed on this subject prior to breeding. Dr. Pitcairn's book has excellent information on this topic as well as specific recipes suitable for use during the gestation period. A pregnant dog needs regular exercise to maintain fitness and keep the muscles in toned condition, but don't overdo it. Keep her at about the same amount she has been used to except back off a bit during hot weather. She'll need to keep up her strength, but you don't want to create any stress. If she's a little over weight going in to her pregnancy, don't try to deal with it at this time. On the other hand, over weight issues relating directly to the pregnancy, are definitely a concern, so make sure the vet monitors this situation during her pre-natal visits. In fact I can't stress enough how important it is to have a trusted vet or knowledgeable breeder available to answer questions that come up during the gestation period. At the same time, become well informed yourself on all matters related to dog pregnancy including: Vaccinations, which are generally not recommended during pregnancy - best to have them done before or after breeding. However, parasites and worms are important issues which need to be taken care of by your vet. 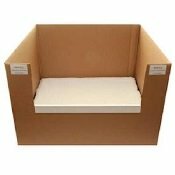 It's time to set up the whelping box in a quiet and warm area of your home and make sure all birthing supplies you need are close at hand. Puppies cannot control their temperature initially and need to be in a warm environment of around 85 -90°F. Care of your pet during the three weeks before and after birth is a crucial time. This is when you must completely isolate your dog from other dogs. The reason for this is to protect her from any possible contact with the canine herpes virus which can be very dangerous to mother and puppies. When the anticipated "birthday" arrives, it's time to bring out your reliable pet thermometer and start monitoring your dog's temperature. When it falls below 100°, from the normal 100°-102°, this will be your clue that labor is usually about to start so keep a close watch during the remainder of this day and into the next. When you know that your pet is about to go into labor, notify your vet - especially if it's near a weekend. You'll want to know who to call if he's unavailable just in case you need assistance during the birth. And be sure to check out the DVD shown here to better prepare yourself. If your pregnant dog does not go into labor around the expected time frame, or if labor doesn't begin within a day after the temperature falls, call your vet. In fact, any concerns should be reported. Although the mother will normally handle the delivery and cleaning of the pups herself, make sure that she does clean off the membrane from each puppy immediately to prevent suffocation. Be ready to step in and help if necessary. Also, you will need to take care of tying off and cutting the umbilical cords. Have your vet instruct you in these tasks prior to the birth so that you are well prepared and confident. If you are unsure of anything during the delivery, you know the drill - call your vet! It's best not to take any chances with those precious lives. The delivery is over and all is well - well not quite! Your postpartum girl needs to visit the vet within 24 hours so you can be assured that everything is as it should be. Then comes the awesome responsibility of caring for those tiny and fragile new lives. You will need to monitor the puppies' temperature, weight gain, nursing behavior and elimination for signs of any problems. They are especially vulnerable during the first two weeks of life as they are both deaf and blind for ten days or more. They will need your undivided attention to keep them protected and healthy. Immediately after birth, the new mom needs to be kept free of stress and drama. During this time she starts producing a very nutritionally rich milk known as colostrum. This special milk is vital in strengthening the immune system of the puppies and providing protection against diseases. It's best to keep visitors away during at least the first two weeks following whelping. Visitors can easily bring with them the seeds of diseases such as parvo which can be deadly to vulnerable young pups. Being prepared will take the scariness our of this important job so go ahead and read this excellent reference - A Breeder's Guide to Care of Newborn Puppies and you'll coast along just like a pro! During the weaning period, have fun with your puppies before you send them off to your carefully selected loving families who will treasure and nurture them into adulthood.